When discovered in August 1994, the Wollemi pine was hailed as the "botanical find of the century," like "finding a small dinosaur still alive on earth." It was found by New South Wales National Parks and Wildlife Service ranger David Noble during a weekend bushwalk into a remote 500-600 meter deep narrow sandstone canyon in the rugged and densely forested Wollemi National Park only 200 kilometers (125 miles) northwest of downtown Sydney, Australia (figure 1). Thus this strange tree from the "ancient" past, a new genus, was formally named Wollemia nobilis (figure 2). In the first grove discovered there were only 40 trees in a 5,000 square meter area—23 adults, 16 juveniles, and the largest, a fallen tree 40 meters long with a girth of three meters. Botanists were at first puzzled by the strange features of this pine, a unique member of the "monkey puzzle tree" family Araucariaceae. Conifers have dark green foliage, but the Wollemi pine has bright lime green fern-like leaves on younger foliage varying to a yellow-olive green on mature trees. The mature, dense, waxy foliage is arranged in rows of four. The tree trunks have a distinct knobby, spongy, cork-like bark that makes them look like they are coated with bubbly brown chocolate. 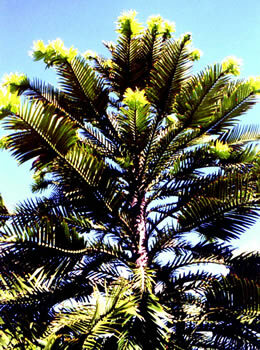 Prior to this discovery, all living Araucariaceae belonged to two genera: Agathis, the Kauri pines, confined to rainforests in northeast Queensland (Australia) and elsewhere; and Araucaria, the Norfolk Island, Bunya and Hoop pines found along Australia's east coast and elsewhere. The Wollemi pine has some characteristics of both these genera, but it belongs to neither. Mature trees are between 27 and 35 meters high. Their structure is complex, with successive whorls of primary branches emerging from the trunks. The upper branches are tipped with bright green female cones and brown cylindrical male cones, making the trees bisexual. Since the initial discovery another grove of 17 trees have been found at an even more secluded location about a kilometer upstream from the first, and a third grove of just three adult trees (the tallest only 15 meters high) around 40 meters up a rock wall in a 150 meter deep slot canyon close to the other two groves but in a different sub-catchment. Thus, the Wollemi pine seems highly specialized in a particular ecological niche, because these surviving trees are only found in deep gorges with similar soils, light regimes, and creeks running in the same direction. These surviving trees appear to have been isolated for a very long time, because the oldest has been estimated at more than 1000 years old. A research team from the Australian National University, Canberra, analyzed genetic markers in eight adult trees from the first grove and four from the second. They compared between 30 and 40 enzyme-coding sites on the genomes of each of these 12 samples and found no variation at all. The team then used a version of DNA fingerprinting which compares thousands of points on the genome, but again absolutely no genetic variation was found. These pines have thus been a small population isolated for thousands of years, and/or the trees in these two groves are clones of one another, having been propagated by coppicing. Indeed, at one of the sites a group of 160 stems appears to be part of a single individual. The third grove of trees being in a different sub-catchment means that its establishment could not have been the result of a seed being washed downstream. Preliminary DNA fingerprinting indicates that these three trees may have some genetic variation. They therefore are most likely a remnant of a much bigger forest of pines. So where did these few, isolated Wollemi pines come from? The fossil record contains no Wollemi pines. The closest match yet found is between Wollemi pollen and the fossilized pollen Dilwynites, the last known occurrence of which is in sediment layers "dated" at two million years old. From then on, the record is silent. It was thus assumed the genus to which this pollen belonged had become extinct. However, the discovery of the living, apparently related Wollemi pines makes them a living fossil. Figure 2. A living Wollemi pine (Wollemia nobilis). The fossilized Agathis jurassica is found in the Talbragar Fish Bed, which outcrops less than 100 km away from the living Wollemi pines (figure 1). In this late Jurassic shale lens with these and other plant remains are beautifully preserved fossil fish (figure 3), testimony to the watery destruction responsible for this fossil graveyard. This shale belongs to the strata of the Great Artesian Basin, a vast sedimentary basin which covers 1.8 million square kilometers or about a quarter of the Australian continent (figure 1 inset) and which thus was once covered by water. The canyons in which the Wollemi pines are found were eroded into Triassic sandstones of the Sydney Basin, which was once a southeasterly extension of the Great Artesian Basin. 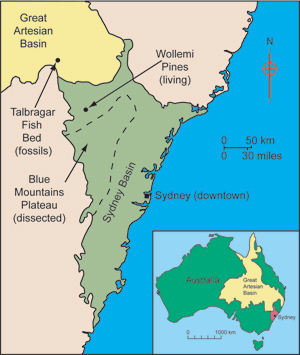 However, the Sydney Basin was cut off from Great Artesian Basin by the Cretaceous, when earth movements began to uplift the Great Dividing Range (the continental divide along the western edge of the Sydney Basin) and the Blue Mountains Plateau (figure 1). It was not until the late Tertiary that the canyons now home to the Wollemi pines were rapidly eroded into the Blue Mountains Plateau. So at least 130 million years separates the burial of Agathis jurassica and the erosion of the canyons in which the Wollemi pines became established. No wonder this living fossil's survival is a mystery to evolutionists. Figure 3. The fossil conifer Agathis jurassica, with an adjacent fish fossil (arrow). Who would have thought that, at the close of the twentieth century, only 125 miles from the center of a sprawling metropolis of more than four million people, scientists would find a previously unknown tree in a rugged wilderness area. It's hard to imagine how this tree, which has now been propagated and will soon be growing in gardens around the globe, could have supposedly been missing for 150 million years. But there's no mystery when this tree's history is understood within God's framework and timescale of Earth history recorded in His Word. Rather than being a living fossil, it is a survivor of the Flood only 4,500 years ago, destined to grow in the new world while its relatives (not ancestors) were buried with the remains of the old world. Anderson, I., 1994. "Pine 'dinosaur' Lurks in Gorge." New Scientist, 144 (1957/1958):5. Anonymous, 1994. 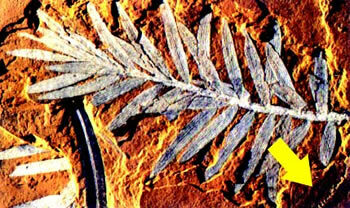 "Australia Hails a Prehistoric Pine" and "'Fossil Tree' Reveals Full Splendour." Nature, 372:712, 719. Macphail, M., K. Hill, A. Partridge, E. Truswell, and C. Foster. 1995. "'Wollemi Pine'—Old Pollen Records for a Newly Discovered Genus of Gymnosperm." Geology Today, 11(2):48-50. * At time of publication, Dr. Snelling was an associate professor in the Geology Department at the ICRGS. Cite this article: Snelling, A. 2006. Wollemia nobilis: A Living Fossil and Evolutionary Enigma. Acts & Facts. 35 (4).